Gracie! A most inspired and creative girl! Meet Gracie! At just seven years old she has boundless inspiration and creativity to share. StudioSeeds is not just for adults; inspiration and creativity start in childhood and Gracie has lots and lots! I’m honored to have her on StudioSeeds. Gracie is an amazing kid. She bakes the yummiest cakes and cookies, dances in formal recitals, makes her own dancing videos, loves all types of fashion and created what I like to call “Gracie’s Great Emoji Project” — it is a delight. SUZE BIENAIMEE: Gracie, welcome to StudioSeeds! I’m so excited to have you here to share your passion with StudioSeeds readers! What inspires you? 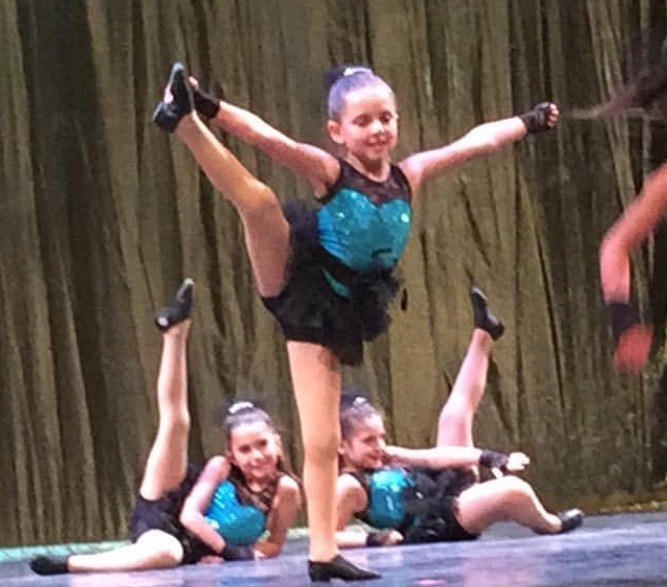 GRACIE: I love baking, dancing, fashion and emojis! Gracie on Baking: It’s fun; I like putting all the ingredients together and then I get to eat what I make! Gracie’s Cake: Guess her favorite half, strawberry or chocolate? Gracie on Dancing: I like to actually dance — the movement. I like all kinds of dancing and music. Gracie ready for her dance recital. Gracie: off to her dance recital soon. Gracie dancing on the table in a music video she made. Gracie on Fashion: I like the making of fashion and wearing it too. I’m making a shirt right now. Gracie on the runway at her fashion show wearing the clothes she made. Gracie in birdwatching fashion looking at an indigo bunting. She’s a budding ornithologist too! Gracie on Emojis: I like the kissy face with the heart eyes best. Gracie likes this kissing emoji with the heart eyes best! SUZE BIENAIMEE: Gracie! Wow! You are so creative and inspiring! Thank you for being on StudioSeeds. UPDATE: Gracie, now eight years old, staring as Sandy in Grease! Gracie, StudioSeedsKid, is Sandy in Grease the Musical, 2017, 8 years old!